Update 5/16 8:20am): $2,249.99 pricing has been matched by Amazon. 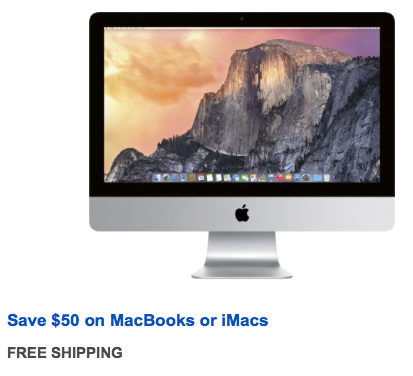 Best Buy currently has a two-day sale discounting a number of Apple iMacs, as well as HDTVs, digital camcorders and more. The highlight of the sale is the Apple 27-inch iMac w/ 5K Retina display (MF886LL/A) 3.5GHz/8GB/1TB for $2,249.99 shipped. That’s just under $250 off the regular price, within $20 of the best price we’ve seen and the best current price. If you have access to a .edu email address you’ll be able to save an additional $50 by visiting this promo page, yielding the lowest price we’ve seen. This Apple iMac includes a 27-inch Retina 5K IPS display with a native resolution of 5120×2880, a 3.5GHz i5 Quad-Core processor, 8GB of RAM and a 1TB Fusion Drive. Additionally, it supports 802.11ac wireless and has two Thunderbolt 2 and four USB 3.0 inputs. Here's you'll find all of the best HDTV deals, both 1080p and 4K. Since 2015, many of the top releases from Samsung, VIZIO, LG and others have included smart functionality with access to streaming services like Netflix, Hulu Plus and others.